This unique chamber (left), designed to emulate the conditions thought by some creationists to exist on the early earth is housed at the Creation Evidences Museum in Glen Rose, Texas. It provides double atmospheric pressure, enhanced oxygen and protection from ultraviolet radiation; while the magnetic coils attempt to make up for earth’s reduced magnetic field. Initial results from ongoing tests with fruit flies, poisonous snakes, and other organisms point to some dramatic differences in creatures living in this environment compared to a control group. For example, the lifespan of fruit flies has been tripled. 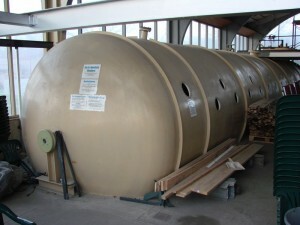 A 62 ft hyperbaric biosphere (right) is currently under construction. This controlled environment will actually have an anteroom, such that attendants came enter, close the door, and bring the room up to pressure, and then enter the chamber. Thus organisms in the chamber will be afforded a stable pressure over time, allowing for long-term experimentation. Perhaps further research might lead not only to improved models of the early earth, but even to some useful medical insights. It would certainly not be the first scientific breakthrough to result from studying the Word of God!